that's broken, damaged and distressed? Could it be treasure? Could it be transformed? Well, we've got the answers, and we've got the experts, here on Restoration Roadshow. Welcome to Burghley House in Lincolnshire. which makes it a fitting venue for today's Restoration Roadshow. There are plenty of people arriving here today with intriguing family treasures. Everyone's keen to know just how much they're worth. As it is, it's a £100 sort of thing, isn't it, really? Should they be spruced up and restored? -I let the grandchildren play with it. -I like grandchildren, cos they bring me lots of work. -..or simply end up back home? Coming up, a 17th century wine jug finds a big fan. -But its owner isn't so sure. I think I like it more than you do. Yeah, I'm sure you do! And we're hoping this beauty will woo the crowds on auction day. -At £50, and 5 now? -A bit more than that. Burghley House is over 500 years old. It was built for William Cecil, Queen Elizabeth I's trusted adviser. With so much history within its walls, Burghley has more than its share of restoration challenges. Later on, we'll see how conservators are quite literally piecing its past back together. I opened a drawer, and found a wonderful bag of bits, and a box. But before that, we have a saying here at Restoration Roadshow - one person's junk is another's treasure. Well, here's a pot with a bit of history to it. I'm just intrigued to know which bit of history you can tell me about. It's always been there in my mother's home, and then when she died, it came to me. -Do you know when it was made, where it was made? -I thought it was either Dutch or German. Ooh, yes, very good. You're absolutely right. 'This jug would have brought German wine to England in the late 17th century. -This face - bit scary, that, isn't it? -It's enough to stop a clock! I don't want to be unkind, but that's only a face a mother could love. -But I know who that man is. Do you know who this is? Let me tell you. He was a cardinal, and his name was Bellarmine. 'Ironic - an anti-drinking cardinal giving his name to a wine jug. And is it something you were thinking of moving on, for want of a better expression? In its present condition, I think it's somewhere in the region of possibly £600 on a good day. 'but this old chap needs a serious facelift if he's going to get a look in. 'Roger Hawkins is a leading expert in ceramics restoration, with many international clients. Come across many of these in your time, Roger? I have, yes, indeed, but not always as nice as this, because this I want to take home. -I do. I love this. -But I think I like it more than you do. -Yeah, I'm sure you do! that's a good sign of quality, because that would have meant an extra firing. It would have been a more expensive piece than the ordinary, common Bellarmine jug. The damage, fortunately, is not too severe. It's perfectly restorable. The cost of that restoration, approximately? -And that would include cleaning, because it is very, very grubby. and let's keep our fingers crossed that the world embraces it, not just Roger. -And we get it into the high hundreds and maybe, with a bit of luck, even a little bit more. -OK. You say, "Yes, Eric." -That's all I need to hear. 'He may not be tall, dark and handsome, but he's survived over 300 years of hard living. 'In his slightly grubby state, we think he's worth £600. -We'll come back in at £500. -Come on, keep it going. 'Some of the items we see here on Restoration Roadshow are far more than just decorative. 'They're a wonderful glimpse into our social history. 'Craig Benson has brought something special in to show Louise. So, how did you come by this poster? It was brought into our shop in Stamford by a man who thought I might be interested in buying it. Fantastic. It's a really striking piece, isn't it? Lovely, vibrant colours. So, do you have any idea what the date is on this poster? apart from the fact that the styles of the clothes and the make-up would suggest Second World War era. Interestingly enough, it's actually printed on linen. It's not paper. So that would figure, as there was obviously a shortage of paper during that time. 'But this cover girl hasn't had any admirers for a long time. As it's been rolled for some time, it's got this sort of undulation. and that would be pulled around in a strainer-type way around a piece of board. -That would cost in the region of £95 to do. the interesting thing is that this could sell for around £150. -So, do you think this is something you might like to go ahead with? It's a shame that something so striking isn't actually out there and being enjoyed by somebody. 'So, as it is, the poster's worth around about £40-£50. 'and we hope it'll bring in £150. has taken a few knocks, but is it beyond repair? -There's a huge section of brasswork missing there. And will it be drinks all round when the Bellarmine jug goes to auction? 'Here at the Restoration Roadshow, our furniture experts are familiar with a very nasty customer. 'It's water, wood's number one enemy. 'It seeps deep into the grain, causing severe staining. 'working on everything from 300-year-old walnut tables to modest family heirlooms. 'I like to call him the wood doctor. That is really vicious, I have to say. -I can't imagine what did that, actually. I can't guarantee that we can remove that mark. -I will only know when I try, so don't expect it to disappear. -What about the other marks? Oh, I like that. It's really scars of its age, isn't it? It's been well used, well loved, apart from the little bit of accident there. Don't expect it to disappear. If it does, that's absolutely fantastic. 'It's always a real treat to see an item that reflects the skill of its maker. 'Our next sickly patient, a Louis XIV-style bureau from the 1880s. 'In its day, it would have been specially commissioned, and something of a status symbol. 'Owners Elizabeth and Stuart Smith are hoping to stop its steady decline. 'Rodrigo Titian is supremely skilled at marquetry and gilding. I have to thank you for bringing this amazing piece of furniture in. Look at the colours, look at the work that's involved. And how did this come to be in your possession? Well, it belonged to my mother, and she bought it off her mother. -Bought it off her mother? -I thought I heard that right. Yes, that's correct! I don't know what the price was, no idea. So, that's what she had to do. -And it was sat there from me being about five or six. -so I don't want to now, because of that. -She had a good eye. This is really an amazing example of Boulle work. 'Boulle work was named after Frenchman Andre Boulle. is just the incising of brassware, the thin brass plate into the tortoiseshell itself. There's a huge section of brasswork missing there. -A little bit of lifting there. And... Lovely, a lovely piece. Now, do you have any idea of its value at the moment? Its value at the moment, pre-restoration, is about £350-£400. but a kind of average figure of about £800-£850 value post-restoration. The first option, if we were just to do the essential, about £200. about £800 on top, so a total of £1,000 there. -We're definitely going to have it restored, aren't we? And thoughts on the options? -Probably the second one, don't you think? It's no good going so far, and then thinking, you know, "It could look better." 'to preserve this breathtaking piece for future generations. What I don't want to do is to aggravate the actual piece itself. Done incorrectly, it can actually completely ruin the piece. Coming up, don't try this at home, kids. Tim tries a radical approach to remove that water stain. I've got a jar with some hot water here, and some oxalic acid. How many years has it been in your family? Well, in the family, since the '50s. 'just on a slightly grander scale. 'Over the years, the Lords of Burghley have added to the treasures here. 'and he brought back loads of Italian masterpieces. because there are such incredible riches here, and particularly in the grand tour collecting. So, as a study house, Burghley doesn't get any better than that. Those bits were from an 18th century frame made out of scagliola. A plaster made from marble dust, it can be a nightmare to restore. so to see something raised from the dead is exactly what I love to see. to produce this stunning result. I've never, ever seen another one like it anywhere. So, I'm not sure if it's unique, but it appears to be so far. Quite splendid. The hours lavished on this piece have been time well spent. 'Back at the Burghley roadshow, we're seeing our own fair share of antique casualties. -So, can't blame you for that. -No, no, no, no. It came as it is! 'He's using it to bleach the stain. 'Too little will leave the mark untouched, but too much will eat into the wood, damaging the top. I can definitely see the stain lightening as I work on it, which is really good. It's definitely gone lighter there. You can see, I think it's working quite well, actually. so if you've got some movement when you first do it, you know you're on to some form of success. You can actually paint this on and nothing happens at all. 'But will Tim's delicate brushwork be enough to banish a century's worth of dirt and staining? 'In a moment, we'll see if he's passed the acid test. 'Our restorers have been busy nipping and tucking at today's Restoration Roadshow. 'But sometimes they need a more controlled environment to finish the job. 'Remember that Bellarmine jug with a broken neck? I've stuck the top back on. I have made good the join between the two materials. There was a piece here I've put back in. His eyebrows here were a little bit chipped. I've remodelled that back in. My task now is to give it its first coat of paint. The jug's covered in a salt glaze. which means working in very careful stages. I'm going to paint what needs to be the lightest colour. It's no use painting this brown on here. I've got to go for this undercoat colour. That's the colour I'm going to go for first. I'll leave it on, and then over that, I can then put the brown colours. because if that's wrong, then the topcoat will be wrong. Roger must also use the right technique to apply the paint. Airbrushing best mimics the glaze. But will Roger's meticulous work intoxicate the bidders when it comes to auction? Remember the 19th century Louis XIV-style desk with all its intricate Boulle work? In his workshop, Rod has begun the delicate process of repair. We need to actually plot out the design of the section that's missing on here, and then cut this out. This is very, very thin, about a hundredth of a millimetre thin. So you can actually see, you know, the fact that it really is like paper... Cardboard, if anything. Rod sandwiches the wafer-thin brass between two pieces of veneer to help keep it steady. when Boulle work was first evolved. and when he peels away the veneer, hey presto! It's all literally... It's cut away so nicely, nice and cleanly. So I'm just going to try this in position first, just dry, just to make sure it fits nicely. I'm going to have to make a couple of adjustments. but generally, that's come out quite nicely. It's quite happy with that. Impressive stuff. But it's just the first step in what will be a painstaking labour of love for Rod. Louise is back in her workshop too, along with that crinkled linen fashion poster. She's mounting it ready for auction. and Louise wants to keep it in tip-top condition. But this is the only chance to get it right. is that you can get this terrible bowing. You would end up with a very warped board, and this way keeps it nice and rigid, which is what you want. The next stage is to glue the poster onto the board. It might seem like a simple job, but if she gets it wrong, she might damage the artwork. and then we can't... You know, if we happen to pitch it wrong, it will actually end up in the wrong place. but will the end result catch the eye of the bidders when it comes to auction? Restoration work requires incredible concentration and many lonely hours in the workshop. But at the end of the day, it's the result that counts. Remember the water-stained Georgian chest? -You've managed to get it out. Remember the blackened and scarred surface? Now it's hard to believe it was ever there. Fabulous. That's really, really, really lovely. What's surprising is you managed to get the mark out. You can see where it's eaten into the wood. It's slightly rougher there. But that's purely because that's what the water had done, eaten into the timber. So today's top tip, folks, always protect your wooden surfaces. Rod's finished work on that Louis XIV-style bureau from the 1880s. So let's have a go. -Oh, he's cleaned the cherubs. -Yes, I can't believe what it looks like. Before, the bureau was tired and patchy. Even the inlay was coming away. Inch by careful inch, Rod's re-laid the brass and tortoiseshell. I have to say, his efforts have been highly successful. There were lots and lots of areas missing. you could see and hear all the raised sections of brasswork. So, was it worth parting with £1,000? -I think it looks absolutely fantastic. and hopefully it will stop in the family many, many more years. 'What a cracking result, but there's more to come. 'which we'll now be taking to auction. 'The wrinkled 1940s fashion poster. 'We're hoping a facelift will help it bring at least £100 at auction. 'And I've taken a liking to the ugly and ancient Bellarmine jug. 'It's bursting with character, but will the bidders agree, and pay up to £1,000 after restoration? 'It's the moment of reckoning here at Thomas Mawer & Sons in Lincoln. 'The viewing room is full of antique temptations, and we've brought along some treats of our own. It looks lovely, doesn't it? and the sheen and the colours I think are lovely. You've done very well. -Thank you. A little bit different, a little bit neater and tidier than it was last time. 'Before, Janet's jug had a nasty chunk missing from the lip and neck. It looks as good as the day it was made, doesn't it? You've got a reserve on this piece? We can't offer you any guarantees. No. Well, looking at it now, I'd take it home! What did she say before? "Oh, I don't like it. I think I'll sell it." -Now, it's a different story. It is a different story. That is very impressive. It looks a lot better than it did when I brought it in. and just the sheer condition. I mean, it looks brand new. 'Before, the poster was wrinkled. 'Now fixed flat to a new board, the striking image has a really fresh feel. My hope would be that somebody will give it a good home, and actually put it up on display. 'First up is the Bellarmine jug which Janet inherited. 'It cost £300 to restore. You're allowed that. You are allowed that. Lot number 592, this Bellarmine. Who's going to start this one at £1,000? £1,000, looking for a starter at £1,000. £700. £700 starts it. £700 starts it. 5, then, £500. Anybody going to start me at £500? At £500? No? Not going to go at £500? We've got a bid of £500 on the internet. Back in at £500. Oh, all of a sudden there's action. 550. 550 going to on the net, 550. £600, 650. -Come on. Keep it going. Thank you. £700 out. £700. £700 on the net. At £700. £750 now? No? No more on the net at £750? Out at 750, how infuriating. -As if I'm taking it home. It does, doesn't it? But you're not shedding any tears, I see. No. No, no, no, no. Well, when I saw it restored, I just thought, well, "Do I want to sell it now?" 'Well, Janet's obviously happy with her newfound love. 'Now, it's our fashion icon's turn to strut her stuff. 'Originally valued at £40-£50, Craig invested £95 getting her ready for auction. Lot 510A is the poster. £100 to start me, £100? £50, I'm bid at £50. At £50, and 5 now. 55, 60, 5, 70. 5 now. It's worth a bit more than that. There is a bidder. There it is. £100. Well, you're an ex-owner. but I'd be lucky to get a fiver in the state it was in when I brought it in, so, yeah, it's hugely improved. It makes it a far more beautiful thing. 'and happy that a £100 sale means that it's going to a good home. 'So it's been swings and roundabouts here in Lincolnshire. When I saw how lovely it was, I'm certainly not disappointed. When I get home, it's going back on the top of the stairs. I have to say, as a pot fanatic, I'm thrilled that Janet's found a new passion for her jug. So, join us again for more affairs of the heart, here on Restoration Roadshow. Pottery fanatic Roger Hawkins loses his heart to a 300-year-old Bellamine jug that's fallen out of favour with its owner, while paper conservator Louise Drover strives to make a 1947 fashion poster fit for the catwalk again. And furniture expert Rod Titian undertakes some fiendishly tricky Boule work in order to restore a Victorian chest to its former glory. But will their efforts meet with the approval of the owners? 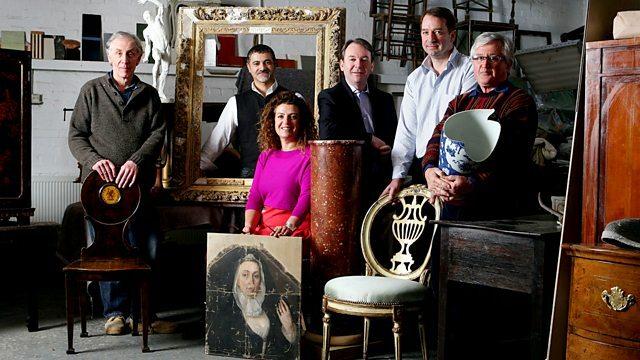 And when it comes to auction day, can the newly restored items steal the show and tempt bidders to part with their money?